So, the XFX Radeon HD 6950 is one of the best graphics cards out there. Period. It isn't the best, but the best ones are simply too good to be practical. Well, this one is too, but its much more practical. Anyway, the XFX offering with this graphics card is a double lifetime warranty. When I heard this, my first reaction was: "I don't plan on living more than one life...", but in reality, that means that there is a warranty on it when you sell it to someone else as well, making the all the better. Plus, if you are technically skilled with things like this, a simple BIOS flash, though dangerous, will bump this up to the same specs as the HD 6970. The 6970 IS on the second tier of the February 2011 Graphics Card Hierarchy Chart. So, this card is amazingly good for its price. In my opinion, its the best buy for the ATI side of the chart. Like I said, this is basically the best, most practical graphics card available. The 2 GB of RAM is absolute heaven for gaming. There is literally no game that it can't play on full settings. One of my favorite things is when I start up games for the first time and they scan my graphics card to configure the graphics respectively and it sets it to Ultra every single time. 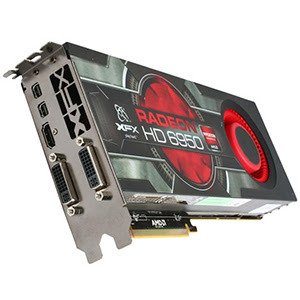 All in all, you cannot go wrong with this card, especially as it supports Crossfire X and Eyefinity. The only real downside to this card is how incredibly huge it is and the installation itself. The thing weighs almost five pounds and is nearly a foot long. Even with my Antec Twelve Hundred Full Tower, there isn't a lot of room left. Most people will either have to mod their case or buy a full tower, which is somewhat of a downside. As for the installation itself, ATI is plagued with driver issues and such. The installation disc doesn't actually offer a whole lot and is basically a physical link to the XFX website where you can download the latest drivers. Its somewhat of a pain, as it would be easier if Windows would do it for me. Really though, for as a good of a card as it is, this isn't too much work. XFX is a company with the slogan "By Gamers; for Gamers". The quality of this card is specifically determined by its ability to do anything. They made it hearty and full of raw power, and that is exactly what it delivers. For around $300, this card is one of the best buys for the price range. With the simple flash to the 6970, it puts this as one of the second best cards available. Also, it puts it as the cheapest second best card available. And with a price difference of nearly $200 for THE best, I would say this is the greatest buy for a newer graphics card. Despite, the size and installation mishaps, the XFX Radeon 6950 is one heck of an addition to any computer. The raw power that it offers is practically unparalleled, especially for the price. If you are looking into buying a somewhat future proof GPU, this is the best you will find. Just make sure you have a full tower.